Recently I had to research radishes and find some new ways to enjoy them for my monthly Journal column. Luckily, I stumbled upon some recipes for kimchi, which took me back to my childhood friend, Helen Cho, and the ever-present jar of kimchi that her mother had available in the refrigerator. My mother’s French-inspired, butter-laden food was nothing like Helen’s spicy pickled cabbage, which I learned to enjoy after adjusting to the heat factor. And now, with my first two batches of kimchi under my belt, I am ready to continue exploring this fascinating, delicious way to preserve and consume the season’s finest vegetables. 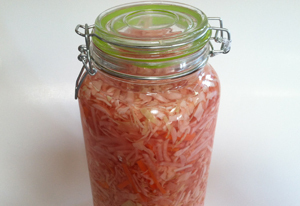 The first kimchi I made was more like a quick pickling, since nothing had to sit on the counter and ferment. But it was easy to make, pretty to look at in its jar in the refrigerator, and a delicious source of ready-to-eat food. I made extra rice to have on hand, and presto, a yummy healthy lunch or side dish was easy to grab. The second type of kimchi that I made had to sit on the counter to ferment. Within about 18 hours it started to bubble, and then I followed the instructions to put it in the refrigerator door pocket for the proper not-too-cold location for the next 24 hours. After that, I moved it to the back of the refrigerator, where the recipes said to wait two weeks for it to be ready. (Apparently there are even people who are so dedicated to their kimchi that they buy special refrigerators that are specifically made to accommodate the temperature for perfect kimchi.) Meanwhile, I am still waiting for the 2 weeks to be up, but as I wait, it too is lovely to look at in its glass jar. I’m sure it won’t be anywhere near as spicy as my old friend Helen’s was, but my plan is to continue learning the art to preparing this ancient Korean food, and adjust the spice levels along the way.